Buyers financing fell through. Back on the market. 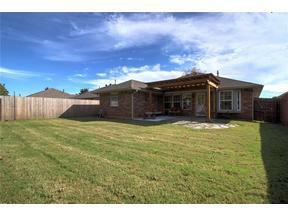 Adorable home in a great Deer Creek school neighborhood with a storm shelter in garage. All bedrooms and living room have ceiling fans. New carpet throughout along with fresh paint inside and out, full gutters, new covered cedar pergola, extended concrete patio, vaulted ceilings, 2" blinds throughout, gas fireplace. Master bath has en suite with double sinks, walk in shower and garden tub, double walk in closets. Cedar pergola over patio is covered. No neighbors behind and trees are behind the fence so less leaves to rack. Neighborhood ponds and playground. Minutes to amenities such as Mitch Park, Uptown Grocery, shopping, restaurants. All this in award winning Deer Creek Schools!